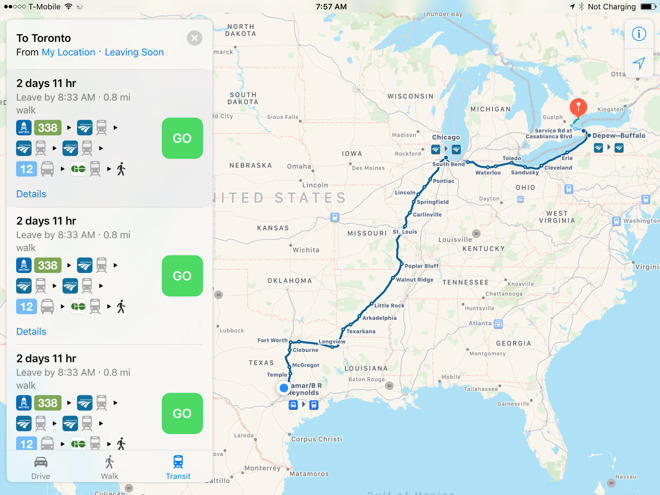 Apple is now offering iOS and macOS Maps users the ability to navigate via Amtrak's full American rail system, plus limited stops in Canada. Previously Amtrak directions were only functioning in the northeast, which while serving a large number of riders, cut off the rest of the continent. Maps users can finally travel wherever Amtrak stops, including the major Canadian cities of Montreal, Toronto, and Vancouver —in some cases though, Maps may suggest switching to alternate transportation to save time. Existing northeastern coverage has been improved, for instance adding the Downeaster, a route between Brunswick in Maine and Boston, Mass. Apple's Amtrak support is similar to its coverage of National Rail in the U.K., in that while essential for cross-country train trips, its usefulness can be contingent on whether the departure and arrival cities have local Maps transit data. Apple has been gradually restoring public transit directions since launching iOS 9 in Sept. 2015. They were stripped out with 2012's iOS 6, as Apple decided to abandon Google Maps data in favor of content from other providers.